A three storeyed residential building collapsed in Mumbai on Thursday morning. As per the reports over 20 people are trapped under the debris. The building collapsed in the Mumbai’s Bhendi Bazaar area of South Mumbai near JJ Junction in Pakmodia street. The NDRF (National Disaster Relief Force) team has rushed to the incident site in a busy market place with 10 fire engines. 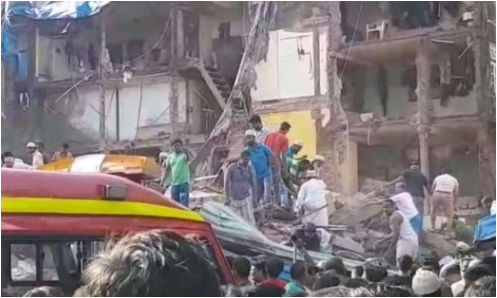 Earlier on Wednesday, the building was collapsed in the metropolitan city, Varsha Nagar area in Vikhroli in which one person is dead and two got injured. In this incident, around 20 people lost their lives and few other are still missing. According to the reports and the eye-witnesses, the efforts of the rescue have launched. The today’s building collapse is the first major building collapse after Mumbai deluge on Tuesday. And the second was the Chandivali crash in five days that claimed six lives. This building collapsed due to heavy rainfall.